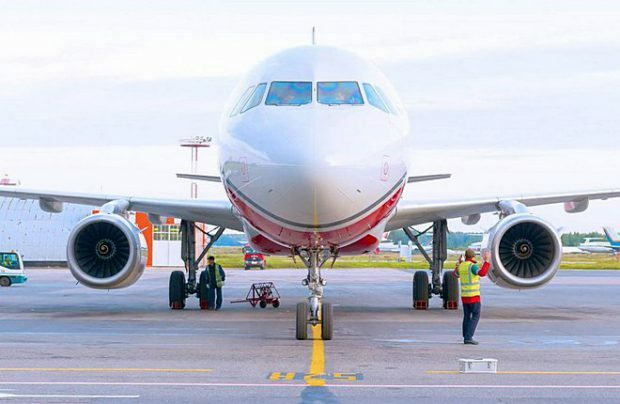 One year in advance of the planned delivery of an Airbus A220-300 (formerly the Bombardier CS300) aircraft, Russia’s Red Wings has obtained state aviation body Rosaviatsiya’s approval for launching a new route linking St Petersburg and Brussels. The thrice-weekly service will commence in the summer of 2019 when six of the aircraft are scheduled to start entering service with the operator, Kommersant business daily reports. The single-aisle aircraft – in a single economy class configuration for 145 passengers – will offer better flexibility in terms of capacity and lower operational costs, which, the airline believes, will give it a head start in price competition with Brussels Airlines, currently the sole operator on the route. The Airbus 220 brand was introduced by the Airbus Group following its entry into a partnership with Bombardier Aerospace. Airbus took a 51 per cent share in the project and aims to expand production to 6,000 units over 20 years, with assembly plants at Quebec, Canada and Mobile, Alabama. Now that regulatory approvals have been secured, the airliners can be marketed under the Airbus name. Red Wings, which is fully owned by the Ilyushin Finance Company, currently operates a fleet of five Tu-204s, eight Airbus A321s and four A320s. The A220-300 offers better fuel economy compared to these ageing aircraft, the airline insists. The demand for services between St Petersburg and the Belgian capital has always been reasonably high, both in the tourism and business segments, a spokesperson for Northern Capital Gateway (NCG), the operator of St Petersburg’s Pulkovo airport comments. Brussels Airlines, which currently operates the route year-round, traditionally increases its frequency during the winter holidays, adding more flights every year. The average fare for each direct flight, according to Russian meta-search site Aviasales, is around 25,000 rubles. However, KLM offers a better deal (on average 20,300 rubles) for an indirect flight (via Amsterdam) and receives 42 per cent of all bookings on the route through Aviasales. Elsewhere, Latvia’s airBaltic has an 11.5 per cent share of the market, with an average fare of 16,300 rubles. So if Red Wings is able to keep its fares below 25,000 rubles, it could end up competing successfully with Lufthansa Group’s Belgian subsidiary. Although the A220-300s will formally be registered with Red Wings, the plan is to operate the aircraft jointly with partner Nordavia (owned by businessman Sergey Kuznetsov, who bought it in 2016 from Nornickel, a Russian nickel and palladium mining and smelting company). The two airlines have been finding synergies in route and distribution networks since striking an alliance two years ago. Last year the two carriers announced the creation of a single management company. In 2016, Nordavia posted a net profit of 1.7 billion rubles and generated 6.4 billion rubles of yield. Red Wings posted 193 million ruble losses and 6.1 billion rubles of yield.